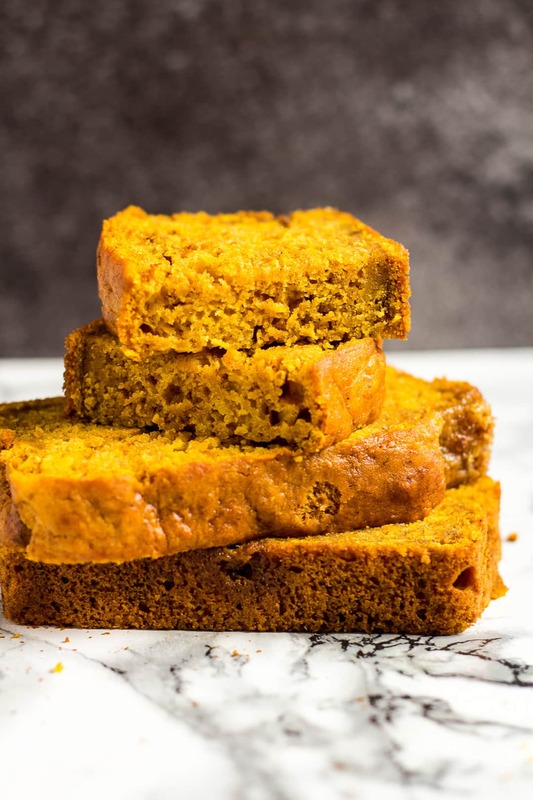 Pumpkin Bread – This incredibly moist pumpkin bread that is perfectly spiced is the BEST way to kick-start your autumn! I’m kick-starting my autumn baking with a classic. A delicious loaf of moist pumpkin bread. 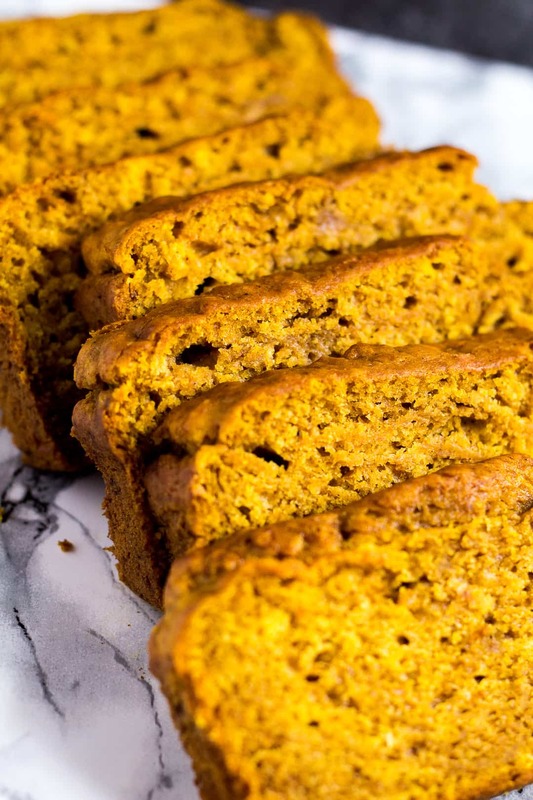 The best pumpkin bread I’ve ever had – you’ve got to try it. I love pumpkin bread. It’s definitely a favourite of mine to make and eat during autumn (any time of the year, really!). This loaf is incredibly moist from the pumpkin, vegetable oil, and the Greek-style yogurt, and it’s super easy to whip up! To make this pumpkin loaf, simply whisk together the flour, sugar, baking soda, salt, and spices. Set aside. Whisk together the egg, vanilla, vegetable oil, yogurt, and pumpkin puree until smooth and combined. Add the dry ingredients, and mix until just combined. Pour the batter into a greased 9×5-inch loaf pan , and bake for 45 – 50 minutes, or until a toothpick inserted into the centre comes out clean. Allow to cool completely in the pan on a wire rack before slicing and serving. How long will this pumpkin bread last? This bread will stay fresh in an air-tight container at room temperature or in the fridge for up to 5 days. 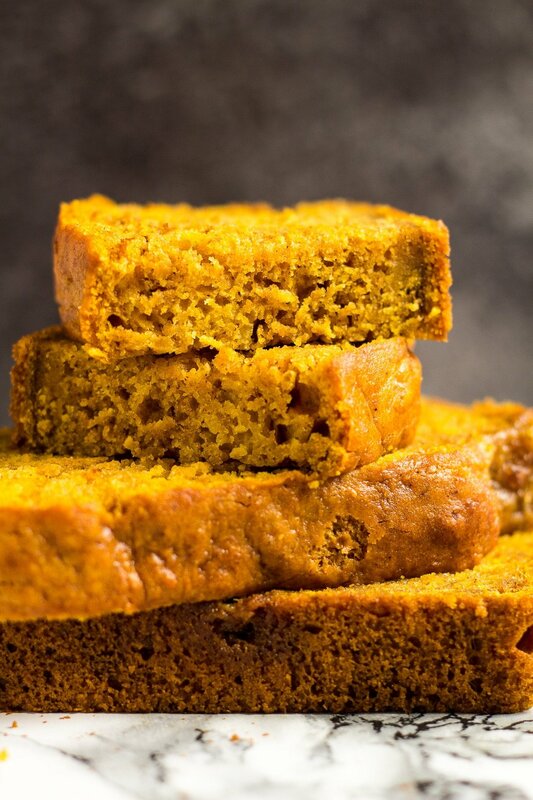 Can I freeze pumpkin bread? Yes! Pumpkin bread freezes well for up to 3 months. Thaw overnight in the fridge. Make these scrumptious bread recipes next! 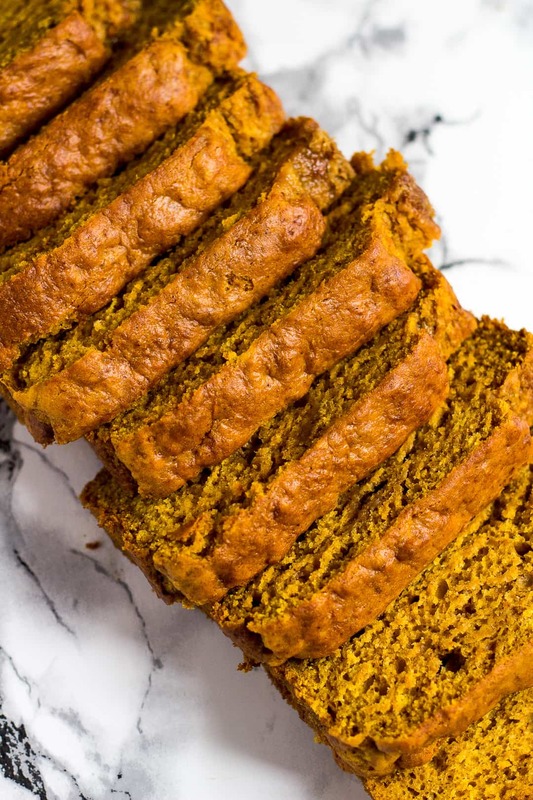 This incredibly moist pumpkin bread that is perfectly spiced is the BEST way to kick-start your autumn! Whisk together the egg, vanilla, vegetable oil, yogurt, and pumpkin until smooth and combined. Add the dry ingredients, and mix until just combined. Do not over-mix. Pour the batter into the prepared pan, and bake for 45 - 50 minutes, or until a toothpick inserted into the centre comes out clean. Cover loosely with aluminium foil halfway through baking to prevent the bread from browning too much. Allow to cool completely in the pan on a wire rack before slicing and serving. 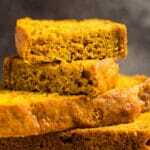 Pumpkin bread stays fresh in an air-tight container at room temperature or in the fridge for up to 5 days. It also freezes well for up to 3 months. Thaw overnight in the fridge. Okay, NEEEED this in my life and soon. I am so beyond ready for all the fall treats! Marsha, this pumpkin bread looks INCREDIBLE!! 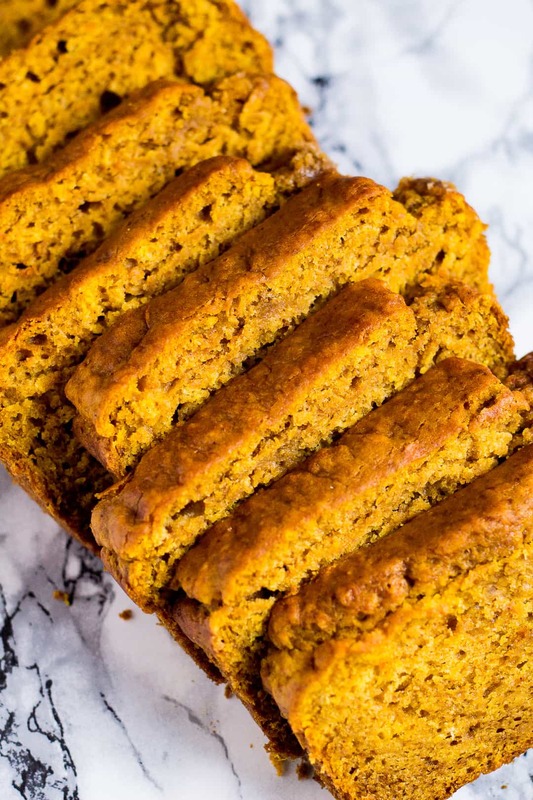 Totally the perfect fall treat–for breakfast, an afternoon snack and a special dessert treat (can you tell how much I LOVE pumpkin bread?)! As always, it’s such a treat to see your photography! Hope you’re having an awesome week! I tried your recipe, mine came out quite darker but it is soooooo delicious!!!!! Great and easy recipe, thanks!!!! Hi Marsha, I recently came across your blog on pinterest and I really like your recipes. For the pumpkin bread, I don’t have canned pumpkin at hand. Can I pure a fresh pumpkin instead? Would it give me the same result please ?